Your purchase of ASCE 7-16 includes access to ASCE 7-10. 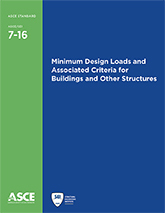 ASCE 7-16 provides up-to-date and coordinated loading standards for general structural design. The Standard describes the means for determining design loads including dead, live, soil, flood, tsunami, snow, rain, ice, earthquake, wind and fire, as well as how to assess load combinations. Significant updates include • updated chapter on tsunami design provisions • new wind and snow hazard maps • improved provisions for rain load design and flat roofs • updated seismic maps and rewritten nonlinear analysis chapter for seismic loads • and new appendix provisions for fire design. • Side-by-side display of Provisions and Commentary. • Redlining to track changes between editions. • Annotation tools include highlighting and adding notes and bookmarks. • Advanced search to look up key words by chapter, section, or specific type of content such as tables, captions, or appendices. • Real-time updates of supplements and errata. • Toggling between Customary and SI Units. An integral part of building codes in the United States, structural engineers, architects, and those engaged in preparing and administering local building codes will find the structural load requirements in ASCE/SEI 7 essential to their practice. By purchasing an item you agree to our Terms and Conditions. Corporate Multi-site Licensing and pricing for additional concurrent users is available.